Heated/Cooled Leather Seats, iPod/MP3 Input, Satellite Radio, Dual Zone A/C, Onboard Communications System, TRANSMISSION: 10-SPEED AUTOMATIC W/SE... EcoBoost Premium trim, Ingot Silver Metallic exterior and Ebony interior. AND MORE! ======KEY FEATURES INCLUDE: Heated Driver Seat, Cooled Driver Seat, Back-Up Camera, Premium Sound System, Satellite Radio, iPod/MP3 Input, Onboard Communications System, Aluminum Wheels, Dual Zone A/C, Heated Seats, Heated/Cooled Seats. Rear Spoiler, MP3 Player, Keyless Entry, Steering Wheel Controls, Electronic Stability Control. ======OPTION PACKAGES: TRANSMISSION: 10-SPEED AUTOMATIC W/SELECTSHIFT steering wheel paddle shifters, Remote Start System, Leather-Wrapped Shift Knob, ENGINE: 2.3L ECOBOOST (STD), INGOT SILVER METALLIC, EBONY, LEATHER BUCKET SEATS 6-way power front seats w/driver power lumbar, driver memory recline and 4-way adjustable front head restraints, EQUIPMENT GROUP 200A. Ford EcoBoost Premium with Ingot Silver Metallic exterior and Ebony interior features a 4 Cylinder Engine with 310 HP at 5500 RPM*. 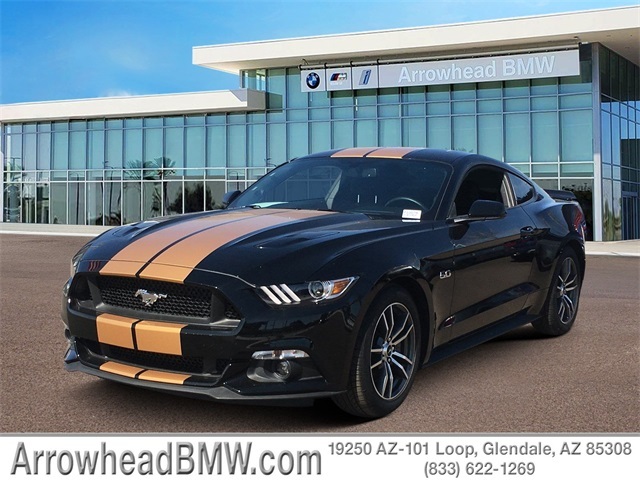 ======EXPERTS REPORT: KBB.com's review says Now a sophisticated modern muscle car, the new Mustang delivers power, style and performance at a price almost anybody can afford.. Approx. Original Base Sticker Price: $33,100*. ======MORE ABOUT US: The prices and incentives shown above may vary from region to region and are subject to change. Inventory is subject to prior sale. Vehicle information is based on standard equipment and may vary from vehicle to vehicle. Please contact us via phone or email for specific vehicle information. All prices plus tax, title, license, dealer adds and documentation fee. All discounted prices include rebates. Customer may not qualify for all applicable rebates Pricing analysis performed on 3/8/2019. Horsepower calculations based on trim engine configuration. Please confirm the accuracy of the included equipment by calling us prior to purchase.